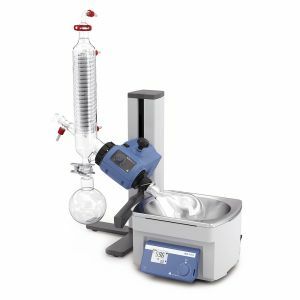 Product Description The RV 3 Rotary Evaporator is the manual basic model in the family of IKA Rotation Evaporators. It finds a multitude of uses in the chemical, pharmaceutical, and biotechnology industries, in research and development, in manufacturing and quality assurance, in laboratories, and in plant construction. Thanks to specially designed glass guides, the vertical condenser makes extremely efficient use of the 1500 cm² cooling surface. Digital displays for speed and heating bath temperature enable optimum control of all distillation processes.